Over the weekend there was an IT outage at British Airways that could have possibly threatened my travel agenda for Monday, but despite the problems, my BA flight to Glasgow was on time! Thank you Lisa Foord for the early ride to the airport! 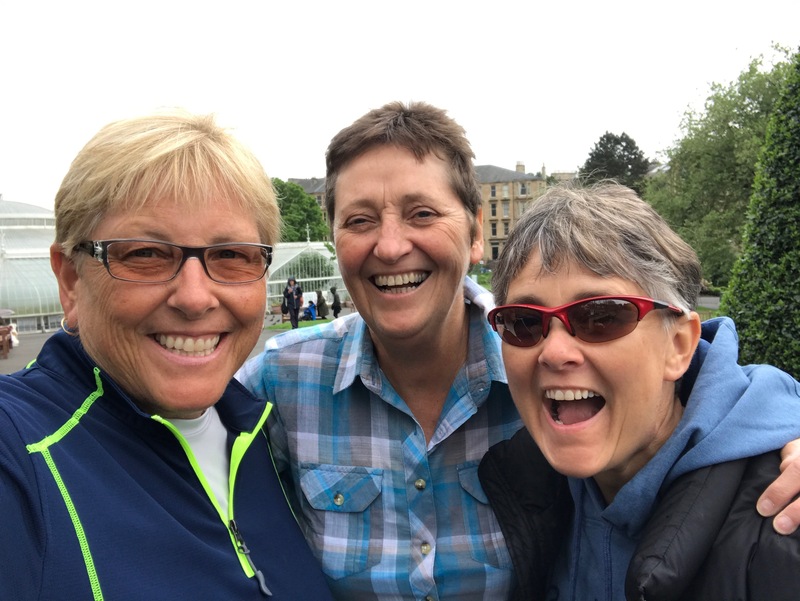 I was greeted with the ever smiling duo, my Uk tournament partner Liz Easdale and Janice Lawson, who hosted me for the next four nights in their Glasgow home. I had never been to Scotland so I was excited to see anything we could fit into three days, and pack it in we did! After an unusually warm weekend in England, it was a wee bit (that’s Scottish!) cloudy and cooler the day I arrived, but still fine to wander the Glasgow botanical gardens and art museum. Over the next few days there were a few showers but generally the weather did not hinder our activities. Here’s what we did in the next three days. 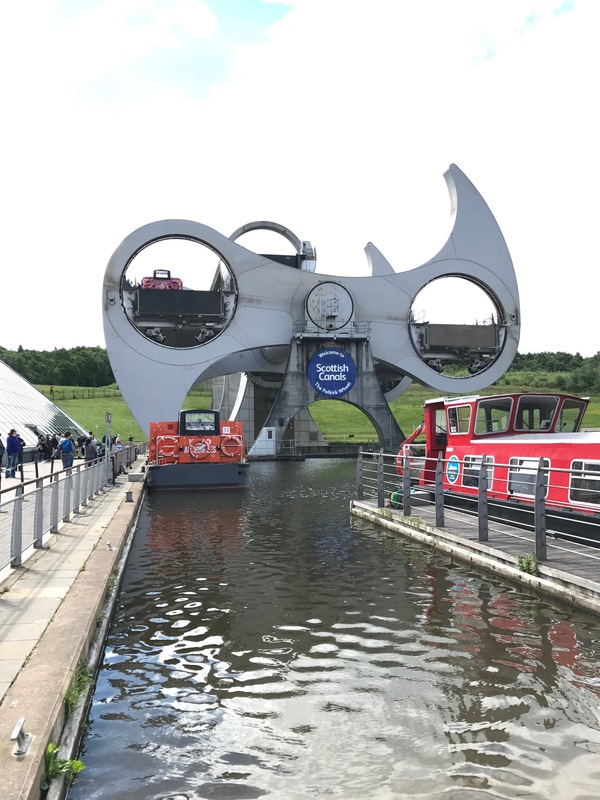 – The Falkirk Wheel. This is a huge steel structure that was designed for and won a milliniumn contest. It’s intent is to bridge the fall gap between two canals of differing heights. In the past, it required canal boats to navigate eleven locks in order to get from one canal up or down to the other. He process would take hours and was exhausting. This wheel allows a boat to change levels in a matter of minutes. Boats enter it on one level, then with very little energy and the help of a very balanced system, it will move in a clockwise rotation to lift or lower the boat to the opposite level to continue its journey. What a feat of engineering! – Pickleball. I enjoyed playing with the Glasgow Pickleball Club for a few hours. There were some good players there who provided some fun and challenging games! 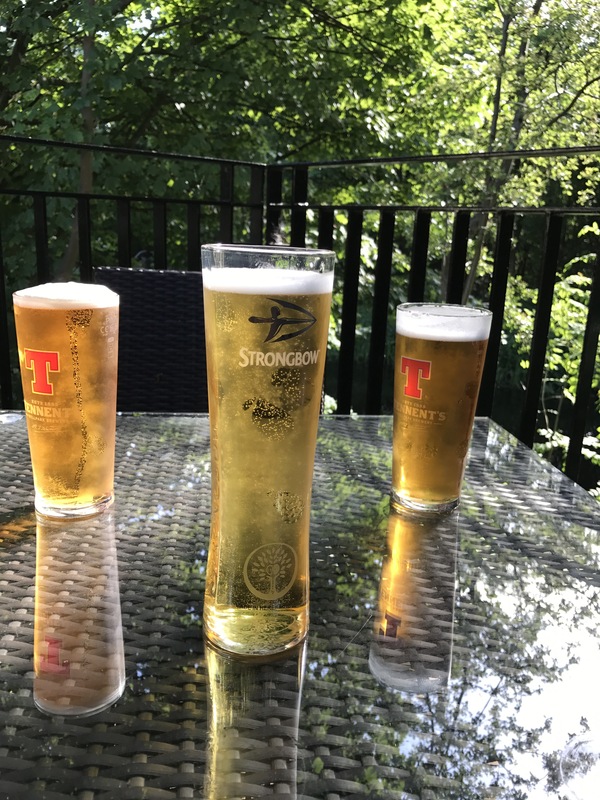 – Pubs (of course…..it’s Scotland!) Britain does have some good cider! – Golf. Pickleball friends Sheena and Mhari (prounounced Vari) invited us to be their guests at Buchanan Castle Golf Club. Entering the clubhouse, it was evident that Sheena has a long history with the club, not only by the historical perspective she was able to share, but by the number of times her name was listed as Club Champion on the walls of the club! 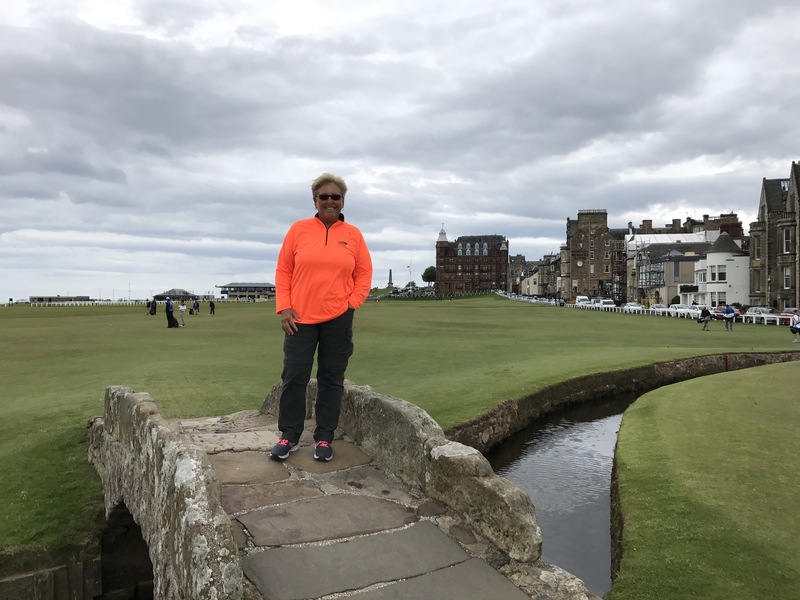 I enjoyed walking the course, the laughs and conversation and of course playing golf in Scotland! I was surprised to learn that walking when playing golf is the norm here, rather than riding in carts (buggies). Many have battery power assisted walking carts (trollies) but still reap the benefits of walking eighteen holes. We enjoyed a nice lunch on the clubhouse lawn after our round before saying goodbye to them. – St. Andrews. On my last day, we drove to St Andrews, which is on the east coast. It was an easy drive through fields of green and pastures of grazing sheep and cows. It was cloudy with a bit of a warm breeze when we arrived. Although we weren’t playing, it was exciting to be there and see the course I have watched others play on television so many times. 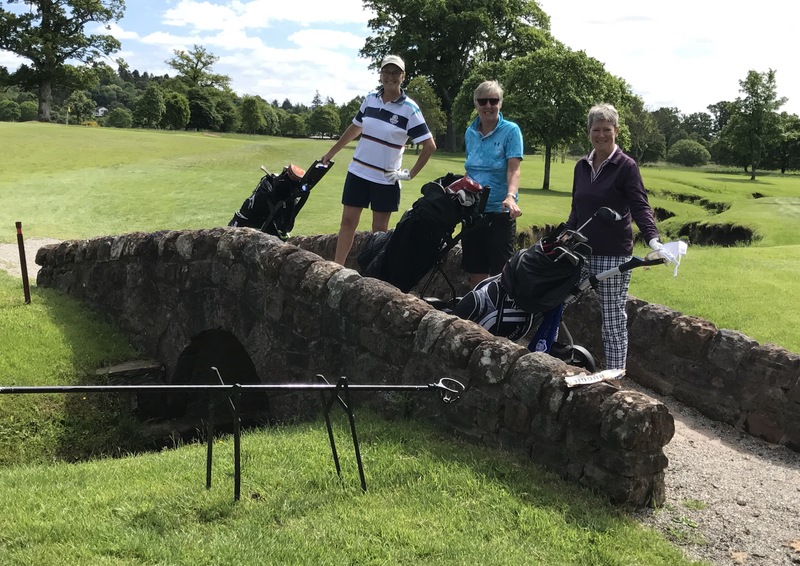 After sneaking a photo on the famous Swilcan Bridge which crosses the burn on the 18th fairway, we stopped for a coffee and soup at the Dunvegan Bar where so many famous professional golfers and celebrites have dined and drank. Afterwards, we wandered the town and to the ancient cathedral relics and cemetery at the east end. There is so much non-golf history in St Andrews dating back hundreds of years relating to the cathedral and the beginning of St Andrews University, the oldest university in Scotland and the third oldest in the English speaking world. Just to the north of the golf course is a wide beach. This is West Sands Beach, where Eric Liddell trained for the Olympics, a story told in the movie Chariots of Fire. The beach running scene from the movie was also filmed here. 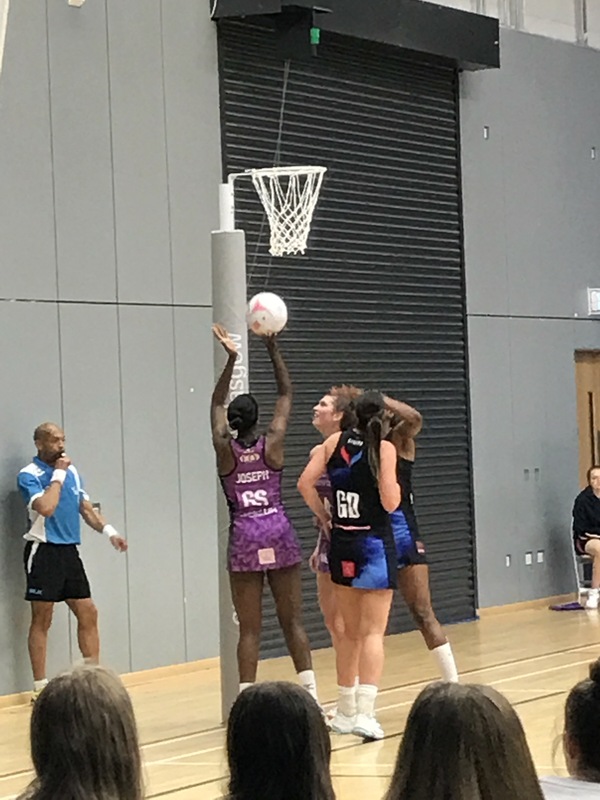 – Women’s professional netball game. Glasgow Sirens vs Hertsfordshire (England) Mavericks. An interesting game much like basketball, yet very different. It took me a while to catch on to the rules, especially the shooting. Once I did and realized that the object of the game was to get the ball to a shooter in the shooting zone, it became more exciting! Glasgow won and ended their first official season in 6th place. I’m now on a Virgin train headed south to visit my long time college friend, Chris in Milton Keynes, England. It’s a five hour journey, but train travel, especially in first class is quite comfortable. So now I’m going to sit back with a cider and enjoy the ride. I might even take a wee nap! 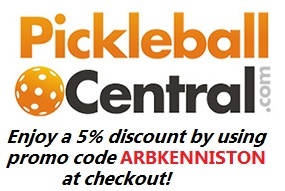 As always, FOLLOW CRAZY PICKLEBALL LADY’s blog by entering your email address and clicking FOLLOW!